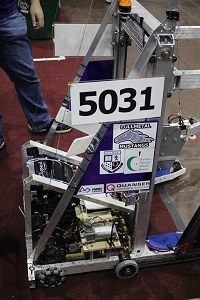 The Construction team is responsible for building the main robot (i.e. frame, structure, motors, mechanical systems and mobility systems). The Corporate and Community Sponsorship team is responsible for creating links to corporations and running fund-raising events to finance the building of our robot. The finance team is responsible for all finances involved in the project using the small business software, Quickbooks. Programming a micro controller to control the robot in the programming language, also interfacing all electrical and electrical systems in the robot. The Strategy Team and Awards Team are responsible for researching rules for the competition and developing strategies to help our team compete. They are also responsible for researching awards for the competition and recommending the best awards to aim for. •Build and compete with a robot of their own design. •Learn and use sophisticated hardware and software. •Develop design, project management, programming, teamwork, and strategic thinking skills. •Earn a place in the Championship. Many colleges and universities, professional associations, and corporations offer college scholarships to high school students on FIRST teams. This is official recognition of the knowledge and technical and life skills these students have gained from participating in a FIRST competition. As of, October 9th, for 2014, we have 150 confirmed scholarship providers that are making available 887 individual scholarship opportunities with a total value of approx. $18,131,757! New providers are joing the FIRST Scholarship Program often- So keep checking back here to see new scholarships! Also, be sure to check the FIRST Scholarship Newsletter for special information.